Want to make your heart sing? Join us and keep your emotional well-being finely tuned! Established in 2013, our SING 2 BEAT BREAST CANCER CHOIR formed as a result of our experiences with breast cancer. Apart from being very uplifting, it’s also great fun to get together and sing. Our aim is not only to support breast cancer charities, but also each other and others affected by breast cancer. We are extremely privileged to have performed at a variety of events including The Pink Ribbon Ball at the Dorchester Hotel, a live performance on ITV’s “This Morning” programme, at the Breast Cancer Care Fashion Show and also twice at the Inspiration Awards for Women. And we have more in the diary coming up, too. We are now looking for some new members to expand the choir. Rehearsals are on Monday evenings from 5th October at 7.30pm – 9pm and we meet in South West London. New members will be asked to complete a very simple and comfortable audition with our Choir Director. You will not be required to prepare anything for this. 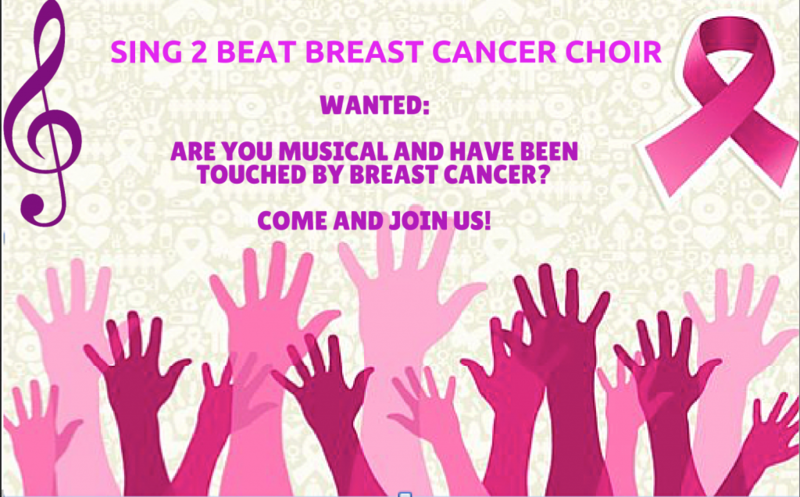 If you are musical with some formal or informal singing experience, have been affected by breast cancer (either directly or indirectly), and would like to join the choir, please contact Anne at sing2beat@outlook.com for membership details. Camilla Kerslake and the Sing 2 Beat Breast Cancer Choir performing “Harmony” (One Voice Always), written by Cecilia le Poer Power & Martin Riley, at the Inspiration Awards for Women at Cadogan Hall on 2nd October 2014. 12 members of the Sing 2 Beat Breast Cancer choir were honoured to perform our charity single “You Raise Me Up” alongside Camilla Kerslake and Blake at the Breast Cancer Care London fashion show in the Grosvenor House Hotel ballroom on 1st October 2014. The Sing 2 Beat Breast Cancer choir sang their single live with Camilla Kerslake and Blake, at a special performance at St James theatre on Sunday 27th October 2013. The Sing 2 Beat Breast Cancer choir, with Camilla Kerslake and Blake, performing live on ITV’s “This Morning” show on Tuesday 15th October 2013. The presenters talked to some of the ladies about their journey in the health item during the show, before the choir, Camilla and Blake sang the single “You Raise Me Up” which they recorded on behalf of the Breast Cancer Campaign charity. What an amazing reception for the song and choir at the Pink Ribbon Ball – a resounding success. Well done to all performing tonight. Don’t forget that you can download the single NOW and raise money for the Breast Cancer Campaign charity. The Daily Mail Online has a wonderful article about Sing 2 Beat Breast Cancer Choir member Sharon, and includes a link to the video of the single “You Raise Me Up”. The single “You Raise Me Up” which the Sing 2 Beat Breast Cancer Choir recorded, with Camilla Kerslake and Blake, on behalf of the Breast Cancer Campaign charity, will be released on 13th October 2013. Please share the link with everyone you know! The single supports Breast Cancer Campaign’s life-saving research to help overcome and outlive breast cancer. All the profits from every download of the single will be donated to Breast Cancer Campaign. Breast Cancer Campaign is a charity that is very close to Camilla’s heart.